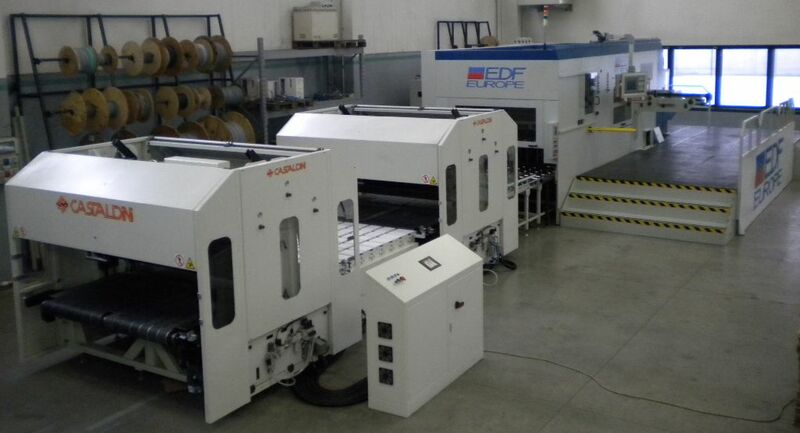 The EDF Europe bundle breaker is suitable to be fitted even on rotary or flat bed die cutters. The machine separates nicks in between die cut blanks in one direction only. The separator is composed by two grippers one fixed and the other moving, the separation point is automatically positioned in between the two grippers, the moving one pull whilst the fixed is holding the other side of the batch,the movement is performed through pneumatic pistons. The transport of the batches is performed trough flat driven belts. Because its size it’s very convenient to be placed on the side of a rotary die cutter . Typical flat bed die cutter application requires double sense separation ,the machines needs therefore to be placed in corner or one after the other with a turning cross in the middle.